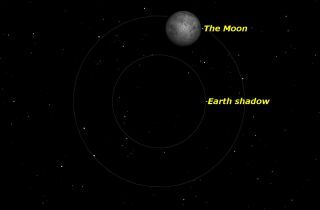 On the morning of March 23, 2016, the moon will dip briefly into the Earth’s faint penumbral shadow in an event best seen from the Pacific Ocean and surrounding territories. Here is how the eclipse will look from Honolulu, Hawaii. The moon will undergo a penumbral lunar eclipse next week that could be visible to observers across parts of North America, Asia and the Pacific Ocean region. For 4 hours and 15 minutes on Wednesday morning (March 23), at least some part of the southern portion of the moon will be within the pale penumbra — the faint outer shadow of the Earth. But skywatchers should temper their enthusiasm: Penumbral eclipses are subtle events that are usually difficult to detect unless at least 70 percent of the moon’s diameter is in shadow. People living in the western and central parts of North America are well-positioned to see this happen (at 4:47 a.m. Pacific Time; 5:47 a.m. Mountain Time and 6:47 a.m. Central Time). But people in eastern portions of the continent will miss out; for them, the eclipse's deepest phase will occur after the moon sets and during the early morning hours, when the sun is above the horizon. Observers in central and eastern Asia — who experience moonrise on Wednesday evening, after the eclipse begins — will be able to see part of the show. The entire lunar eclipse will be visible from the Pacific Ocean, western North America, eastern Australia, New Zealand and Japan. But none of the eclipse will be visible from Europe or Africa. This visibility chart of the March 23, 2016 penumbral lunar eclipse shows the regions from which the lunar eclipse will be visible, weather permitting. On March 23, 2016, the moon will pass through part of Earth's shadow in a minor penumbral lunar eclipse. This NASA chart by eclipse expert Fred Espenak shows details and visibility projections for the lunar eclipse. Why are penumbral lunar eclipses so subtle? Imagine being an astronaut on the moon when Wednesday’s event takes place. You might see an eclipse of the sun, but it would all depend on where on the moon you touched down. From Aristarchus — a brilliant impact crater on the northwest part of the moon— no eclipse will be visible, as that part of the moon remains completely untouched by the penumbra. That’s why the upper part of the full moon will appear to shine normally; no part of the Earth’s silhouette will appear to block any part of the sun from this part of the moon. In contrast, near the moon’s lower limb in the rugged southern highlands is the crater Clavius, the third-largest crater on the moon’s visible near side. From here,the Earth will appear to cover about 70 percent of the sun’s diameter; consequently, the brilliant solar illumination of the surrounding lunar landscape will turn somewhat dimmer. Here’s an experiment: See if you can entice a friend or family member outside during the peak of the eclipse on Wednesday (4:47 a.m. PDT; 5:47 a.m. MDT). Don’t tell this person about the eclipse, but ask him or her to look at the moon and see if anything seems unusual. About that time, even a casual observer— if he or she is looking hard enough — should be able to note a slight diminution of light corresponding to a "smudged" or "soiled" appearance of the moon’s lower limb. Editor's note: If you have an amazing photo of the eclipse or any other night-sky sight that you'd like to share for a possible story or image gallery, send images and comments to managing editor Tariq Malik at spacephotos@space.com.